Nothing is better than a well-roasted chicken. This chicken marinates for at least 24 hours, and up to 48 as this one did. I cut the chicken along the backbone and flattened it out and cut off the wing tips. This helps the chicken cook faster and not dry out the white meat. Is it just me, or do you see the shape of a heart in the breast meat – must mean there is love in the air.. 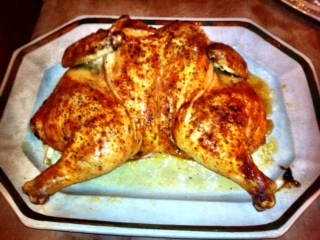 This entry was posted in Recipes and tagged Buttermilk, chicken, Roasted Chicken, Smoked Paprika. Bookmark the permalink.